Matched Betting. It’s the side hustle I probably get asked about the most. If you follow me on Instagram (@Katiesaves) you might have seen this post detailing my side income for the month. This was my best performing Instagram post to date and I’m not really surprised – after all, we all want to know how to increase our income! If you saw that post, you might have noticed an entry of £313 – Matched Betting. That was down to the hard work of my husband, Luke and like the good egg he is, he’s written a guest post for me which I’m sharing with you today detailing the who’s, what’s, when’s and how’s. A lot of people are worried that once they’ve exhausted all the sign up offers, there isn’t any money left to be made with matched betting – but that isn’t true. As Luke will explain, there’s still plenty to be made – you just have to adapt your approach and take advantage of different offers – and that’s where we rely heavily on Oddsmonkey. If you’re thinking about giving matched betting a go, I’d highly recommend you sign up and trial them. If you decide to stay a member the money their tools and calculators will bring you, will more than cover your membership. 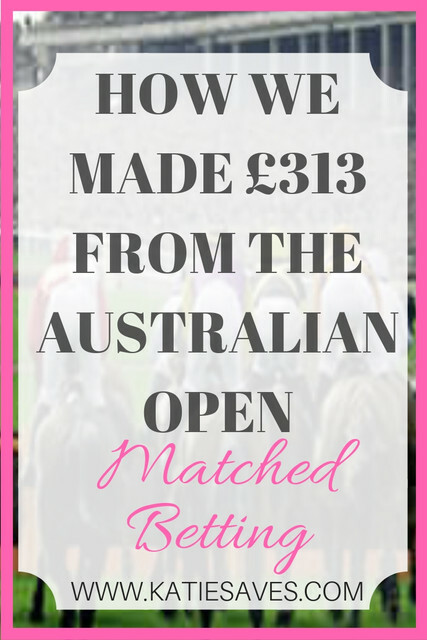 But anyway, here’s how Luke made us £313 during the Australian Open. What Promotions Were On Offer? What was the potential profit for each offer? Where did the profit come from? What size bank did this require? Like this post? You might also enjoy: What’s Stopping You Getting Started With Matched Betting? How much time did I spend on the tournament? What did I consider an acceptable qualifying loss? My wife posted her side hustle profit sheet recently and a big chunk of it was profit I made from Matched Betting during the Australian Open tennis tournament. With an event of this size and popularity, the bookies will attempt to secure your business with promotional offers, this leaves the potential for some decent profits. This post basically breaks down exactly what I did to secure £313 profit over a three-week period. This post isn’t intended to teach you the rules of tennis (with a few exceptions) or to explain each offer in detail, but please get in touch if you are unsure and I will try to make things more clear. None of the money made throughout the Australian Open was guaranteed and it all required a very small risk called a qualifying loss. Tennis is also a very tricky business as if a player gets injured and doesn’t complete their match, they are considered to have ‘retired.’ The tricky part is that different bookmakers require a different amount of the match to be played before the final result is considered official. If you make a mistake and use two bookmakers with different retirement rules and the wrong player retires, you will lose your entire stake. It requires close attention, or if you’re like me, pay a subscription to Oddsmonkey who essentially do it for you. Despite there being more than ten available, I stuck to six main offers. I excluded a few due to requiring in-play bets (university, work and the fact that matches were on between midnight and 8am meant I didn’t have the time to be available whilst the games were being played) and excluded another due to differing retirement rules compared to the majority (Ladbrokes were offering 10% refund as cash up to £100 on all losses throughout the tournament). Due to limited funds, it was important to make sure money was going in the right places and not being wasted. By this I mean it was possible to combine offers giving two opportunities to win for one qualifying loss. Bet365, Paddypower and SportNation were paying out your winnings in full if your chosen player went 2 sets up in the match (this only applies to Men’s tennis as 2 sets up in a Women’s match would obviously mean the match is over). This leaves the opportunity for the opposing player to come back and win 3-2 leaving two winning bets. Another thing to note here is that Bet365 and Paddypower also offer this on certain football markets where you get paid out if your team goes 2 goals up. It is an incredibly generous offer and one of the main matched betting money makers at present. BetHard and BetUK had similar offerings in that you needed your chosen player to lose in 5 sets (once again, Men’s matches only). The difference between them was that BetHard were refunding your stake up to £25 as cash whereas BetUK were offering to refund your stake up to £50 as a free bet (turns out these free bets could only be used on another Aus Open market reducing the value greatly). BoyleSports were offering to double your winnings as a free bet (up to a maximum stake of £20) should your chosen player lose the first set and go onto win the match (Yay, Men’s AND Women’s for this one). One very big word of warning about these lovely lot, they don’t take kindly to being outsmarted and will ban you as quick as they can once they realise you aren’t a mug. I got caught with £104 worth of free bets to use but was unable to as they had completely banned me from placing bets via their mobile app and website. It required phone calls to their customer services to finally get the bets placed. My advice would be to hold off opening an account with these until a significantly high value offer like this comes up again and throw everything you have at them. You cannot go under the radar with these so hit them hard, make it fruitful and accept you will be banned. The potential profit for BetUK was roughly £35 per game (believe it or not, I did not hit one refund with these the entire tournament). The potential profit for BetHard was roughly £23. The potential profit for BoyleSports varied greatly as the free bet was based on your winnings, not stake. My lowest was approximately £10 whereas my largest was approximately £30. As I mentioned above, we had limited funds to use for this (compared to the bank size of other matched bettors). I achieved £313 profit using a bank of £2,500, it seems a lot but don’t forget when you are starting out with Matched Betting, you are guaranteed to make £400+ profit risk free with as little as £100. This grows exponentially the more you keep taking advantage. Obviously, in the early stages of the tournament, there are more people left in which means more opportunities to profit. As the tournament progresses, the amount of matches reduces and so does the time you invest. I started out spending about 3 hours an evening finding acceptable matches and ending up spending maybe 30 minutes an evening towards the end of the tournament. There is this wonderful thing on Oddsmonkey called the Dutch Matcher. It finds the bookmakers offering the best prices on each player and combines them to work what stake you need on each player to secure the lowest qualifying loss. For example, if player one is priced at 2.0 and player two is also priced at 2.0, you would lose nothing at all. See below, £200 invested, £200 guaranteed return. This is only an example and isn’t a common occurrence where you have a risk free dutch, albeit it does happen. Whilst using the Dutch Matcher, I was personally accepting anything over a rating of 96 meaning a £4 loss for every £100 staked. You can use filters to exclude any games that does not meet the criteria you have set. This is quite a high qualifying loss but I was comfortable with the risk and confident that any losses would be more than covered by the offers that did come in. As mentioned in the early stages of the tournament, there are more games. To give myself the best chance of profiting, I wanted to cover as many games as possible. Obviously where bookmakers offer a maximum refund (Boylesports, BetUK, BetHard), you just back to the maximum you can. Whereas with Bet365, Paddypower and SportNation, there is no maximum so you can stake very high amounts making your money management a key factor in your potential to profit. I was placing a maximum of £100 per match in the early stages, this allowed me to get on a fair few matches. This stake increased to £300 a match towards the end of the tournament. Same amount of money used, just less matches to cover. In the first three days, I was down roughly £30. This was mainly due to not hitting a 2Up (your player going 2 sets up and losing the match). 2Up is by far the most unlikely of the offers to happen but when it does, it is very profitable. The others offers were keeping me afloat at this point whilst waiting for that elusive 2up. When I did finally hit a 2up and had my first £96 profit, I actually stopped tracking my profits as I knew that all qualifying losses for the rest of the tournament were now covered. My organisation is appalling and I hate keeping a track of my bets. Katie is bloody good at it, so I don’t need to be! It wasn’t until I withdrew all the money from the bookmakers and transferred it back to the savings that we found out how much we made. That is the beauty of Matched Betting in a way, knowing that in the long run regardless of your ability to keep a detailed spreadsheet, you will be making money. I hope you’ve enjoyed this guest post! 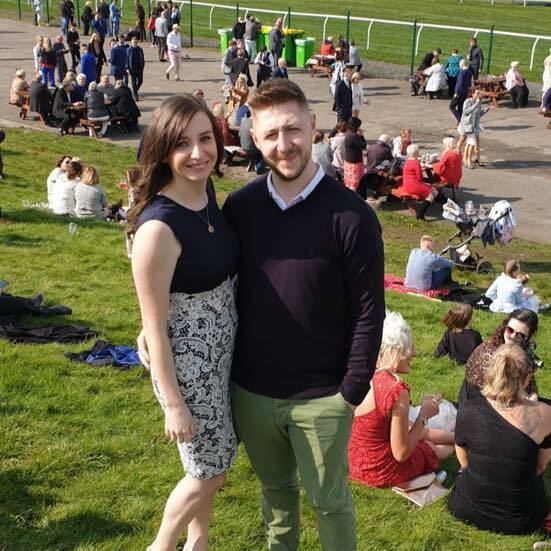 I’ll no doubt rope him in to write some more matched betting posts in the future as between the two of us, he’s the expert! As always, my advice if you’re thinking of just beginning matched betting is read, read and read some more and make sure you fully understand what you’re doing. Please don’t attempt any offers like the ones Luke has talked about here straight off the bat – do all the sign up offers first and build your bank and your confidence. We highly recommend signing up to Oddsmonkey as that’s the subscription we use ourselves but there are others available and the links in this post are affiliate links – which means if you do sign up I’ll earn a commission (but it won’t be an extra cost to you). "Hate Cooking? Here are the Best Time Saving Meal Hacks"
"Reduce Your Energy Bills With These Top Tips"